About an hour's drive north of the Sea of Galilee, you come to this large tel just south of the border with Lebanon. This tel is Abel Beth Maacah. Joab, commander of David's army, pursued a man by the name of Sheba to this city. When faced with seeing her city destroyed, a wise woman made a deal with Joab. She convinced the inhabitants of the city to give up Joab and toss Sheba's head over the city wall and in return, the city was spared. When you visit Israel, you can drive around most of this tel and understand what a beautiful location it was for a city. I would like to follow on a previous post of mine about the ancient city of Abel Beth-Maacah. In that post, I conclude by saying "This year’s excavations are about to start at the site. So, I’m looking forward to seeing what they find." Well, now we know. 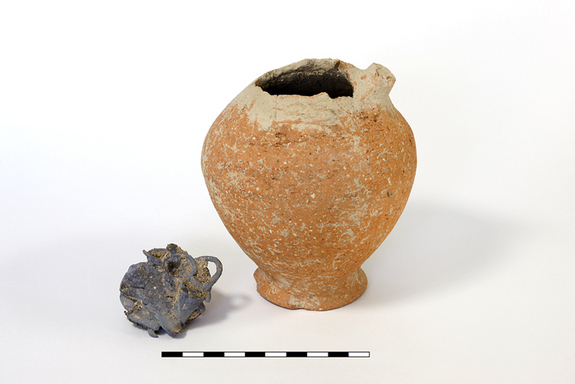 LifeScience.com has a report today of a great find at the archaeological site at Abel Beth-Maacah. Recently, the crew at the site found a small juglet with a number of pieces of silver jewelry inside. I noticed that FoxNews has also picked up the story. The city of Abel Beth-Maacah is in a beautiful location in Northern Israel, just a couple of miles south of the current border with Lebanon. In 2 Samuel 20, the city came under seige by David's army as they were hunting down a man by the name of Sheba. A "wise woman" of the city made a deal in which the city would be saved and in return, they would deliver the head of Sheba to David's army. She did as she promised and the city was spared. The dig season will soon begin at this site for this year. Let's see what this year will bring! To begin, let me encourage everyone to sign up for Todd Bolen's Bible Places blog. (I mention him, as well as others on the "Resources" page of my website.) Every week, he and his writers supply great information about many of the places in the Bible. One of the writers is a gentleman by the name of Seth Rodriquez. Every week, he posts a "Picture of the Week". This week's picture is an aerial picture of Abel Beth Maacah. I will let you read his blog to learn all of the locations in the Bible where this city is mentioned. I have never been in a plane and seen this tel from the angle of this picture, but I have driven around it a couple of times. I enjoy seeing this particular location. It is often overlooked by tour groups. Groups often drive through the upper Hula Valley on Highway 90 to Kiryat Shmona, but then turn east on Highway 99 to get to sites such as Tel Dan and Banias. But, if you travel just a little farther north on Highway 90, you can see this beautiful location. This year's excavations are about to start at the site. So, I'm looking forward to seeing what they find.